You can schedule or make a one-time payment on Cox.com using several payment options. Follow the steps below to make a payment using your checking, savings, debit, or credit card information. 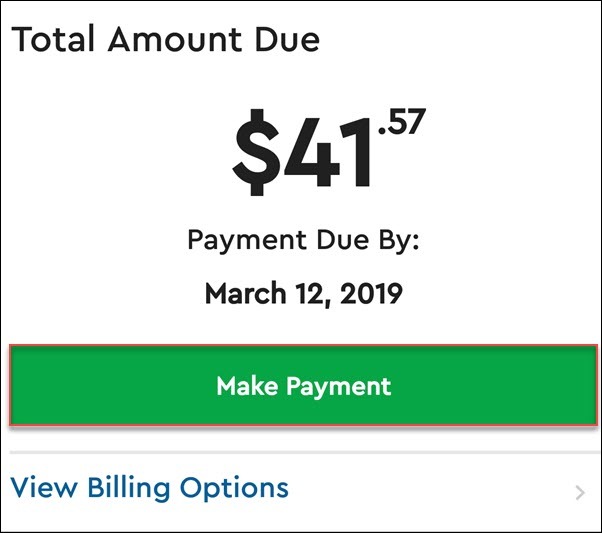 For information on using your smart phone or other mobile device to make a payment, refer to Pay with Cox Connect. For security reasons, only the primary account holder can view billing details, statements, and account history. If the account holder has listed you on the account as an authorized user, and gives you full access to the account, then you can make a payment as well as view billing details, statements, or account history. Begin by signing in to View / Pay Bill with your User ID and Password. Note: To sign in from our homepage at www.cox.com, click the My Account tab, then the My Bill link, which pops up the Interactive Bill Sign In page where you enter your User ID and Password. Under the Payment & Billing Options section, click the green Pay Now button. Select the amount you would like to pay. You can pay the total due or a specific amount. If debit or credit, enter your card number and card details. If checking or savings, enter your routing number and your account number. Note: If you would like to save your payment method, put a check in the Save my payment account details so I can use them to make future payments box. You can choose to use this saved method each time you return to make a payment. If you have a payment method already saved on your account, select Use a payment method you've already saved on your account then select from the dropdown menu. Schedule your payment. Either choose to Pay Today, or Pay On and use the calendar to select a future date. If you do not have a preferred email address on file, enter one now. Note: If you do not enter an email address you will be directed to print your confirmation page because Cox will not be able to send you a confirmation email. Result: The Review Detail and Submit Payment page displays. Review your one-time payment details to ensure all information is correct. Under Terms and Conditions, read the terms then put a check in the box next to I have read and agree to the One-Time Payment Terms of Service. Result: The Payment Success page displays. If you have an email address on file or you entered one, you will then receive an email confirmation that the payment was received. If you did not, you must print the confirmation page. Your balance due is updated on the payment date you selected. The View Bill and Recent Activity tabs are also updated. The Pay Today option updates the Recent Activity tab the next day. A payment scheduled for a future date is listed on the Recent Activity tab. You can cancel and resubmit the payment using a different payment method at any time except 24 hours prior to the scheduled payment date. To pay your bill using your smart phone or other mobile device, follow the steps below. Download the Cox Connect app from your app store. Sign in using your Cox User ID and Password. From the Home screen, tap the Make Payment button. Tap the Pay Now button. 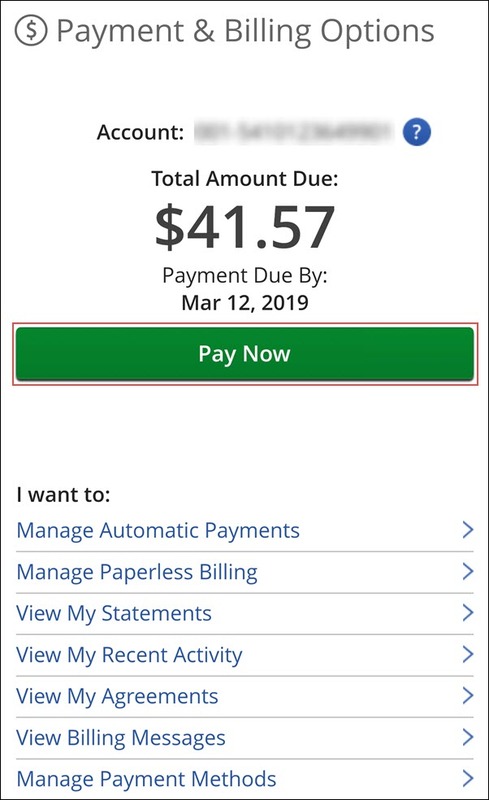 From the Make a One-Time Payment screen, tap the following based on the amount you are paying. 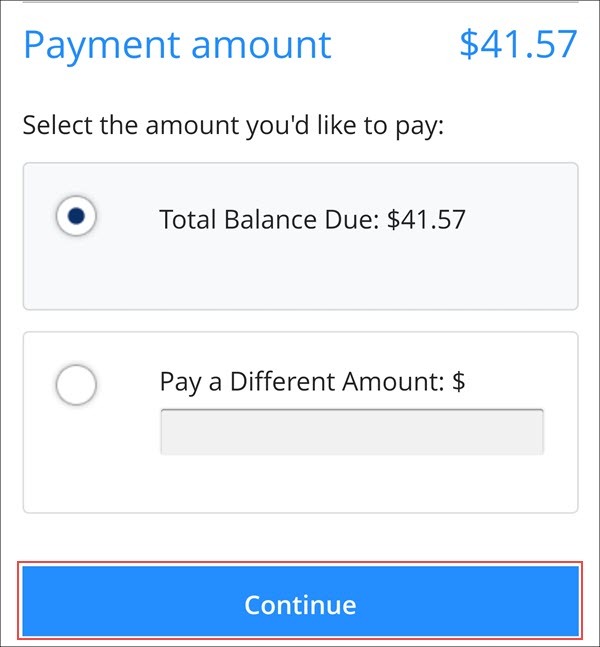 Pay a Different Amount - Enter the amount you are paying. If the card or checking account you wish to use is listed, tap that option. If the card or checking account is not listed, tap Add a new payment method and enter the information. In the Payment Date box, enter the date you are selecting to make the payment. Note: The date defaults to today's date. If you wish to enroll in paperless billing, ensure the option in checked. Review your payment details and ensure all information is correct. Tap the check box to confirm you have read and agree to the One-Time Payment Terms of Service.